A Cornish group is trying to raise £200,000 to buy a the home of world-renowned poet Charles Causley. Causley, who died at the age of 86 in 2003, lived in the three-bedroom Victorian terrace house in Ridgegrove Hill in Launceston for 50 years. There is a meeting on Wednesday night at Launceston College to discuss the fundraising project. The Charles Causley Trust chairman Kent Stanton said there should be a permanent memorial to him. "He was the best poet this country has ever seen and his work will be remembered along with the likes of Tennyson," said Mr Stanton. "I think it's absolutely essential there is a permanent memorial to him." Causley was born and educated in Launceston, where he also taught after the war. 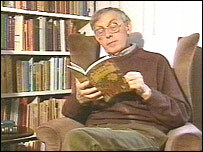 He was awarded the Queen's Gold Medal for Poetry in 1967 and was made a CBE in 1986.